Built from magnesium, the device fixes to a Weaver/Picatinny rail using a quick attach/detach lever. It features digital controls and a host of settings for both brightness and night vision. With a CR123 battery, the Ultra Shot M-Spec can run for up to 2,000 hours on its medium brightness setting. Also, Sightmark said the optic is rated to withstand the .50 BMG cartridge and still operable after being submerged under 40-feet of water. 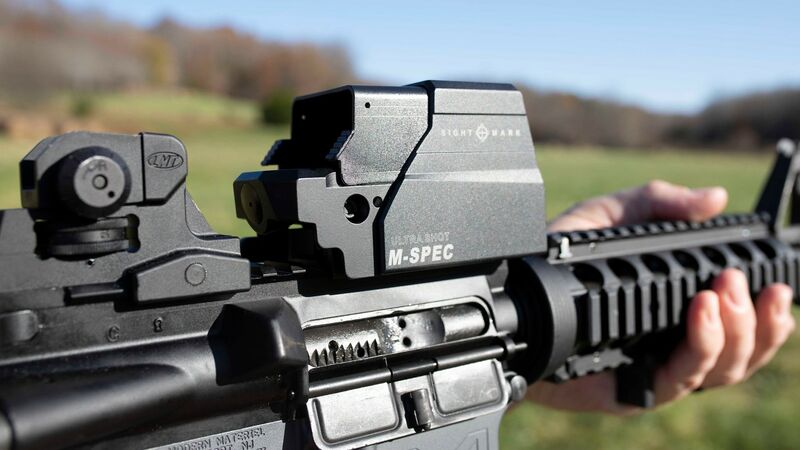 Equipped with dual pane glass and a parallax corrected lens system, the device allows shooters to quickly get on target from point blank range out to the limit of their vision. While the 1 MOA windage and elevation adjustments are a bit bold for some shooters taste, sighting it in was fast and easy. Once zeroed, I found out just how “Ultra” this optic is. Getting on target was fast, I mean really fast. The Ultra Shot has a great field of view and with its parallax correction letting you keep both eyes open, transitioning from target to target was quick as well. It held zero no matter what abuse we heaped on it, or how many rounds we fired and so far we’ve been quite impressed with its performance.